I must give full credit to my wife for this present. 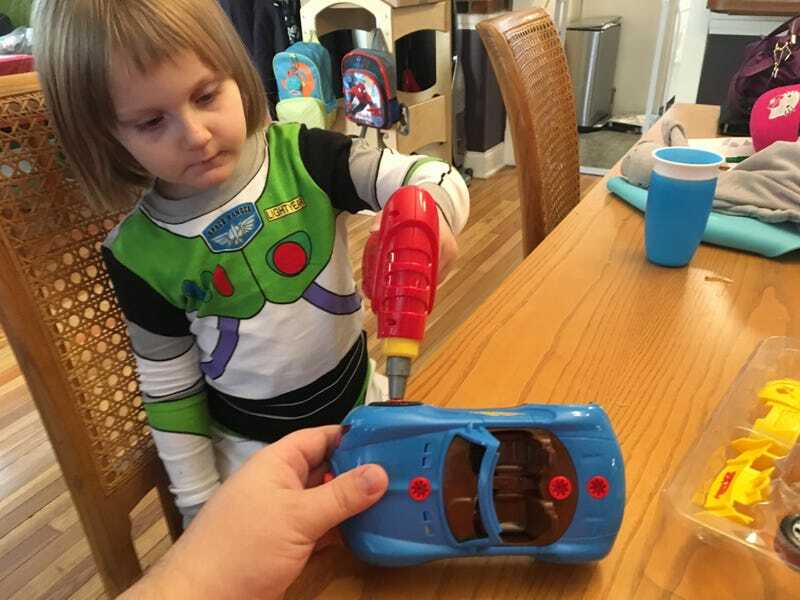 She got our now 4-year old Emma this build your own race car kit. This morning she asked to put it together, so we did. My apologies, in my excitement I did not get a proper before picture. The top shot of her putting a wheel on is the first shot I got. The kit comes with two sets of wheels, several body parts and an “engine”, as well as plastic spline drive screws to attach it all. It also comes with a reversible battery operated screw driver to do all the work. The screw driver is very low speed, low torque, and has a clean tech to prevent the screws from getting stripped. I taught her to start the screws by hand, and how to switch the drill from forward and reverse. It was really very easy for her to do with a little help. After we go all the parts on, we realized the side skirts needed to be attached by pulling the body off the chassis, and sandwiching them in between the two ... so everything had to come back off. And the back together one more time. Here are the extra parts and the instructions. Yes, I am drinking coffee from a Hello Kitty mug. I was really impressed by the kit overall. All done, even with having to pull it back apart, and as less than half an hour.